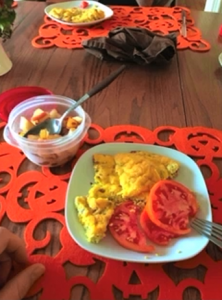 Breakfast again: eggs, tomato. There’s some fruit, that’s apple and pears — the’re okay. Just kind of count the carbs as you go, make sure you’re not eating too many of them. Those are the grapes. The reason we have grapes all the time is my son eats the grapes all the time so there are always some on the table. Look at that. Do you see what’s in the back? Oh, honey, don’t be eating the chips. My wife eats a few chips. Anyway, we’ll go over that later. This is ham, cauliflower. This is cauliflower is cooked with pecans, it’s delicious. It’s actually cauliflower and apples, I think. And more grapes for the son. Look at this — you can’t see, can you see what that is? 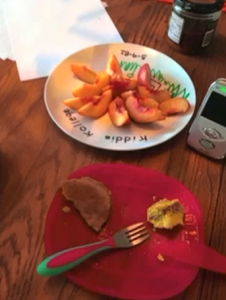 These are peaches, this is egg — I’m sorry you can’t see this, it’s a pancake. Wait a minute, you’re not supposed to eat pancakes. The pancakes came out of the freezer. They’re made with almond flour. So that’s the idea. If you’re gonna mix up a thing of pancakes, you might as well double it, triple it, quadruple it, and have pancakes for a month. You might as well be your own personal Jimmy Dean. 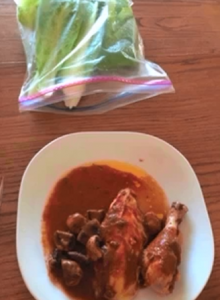 So this is chicken, cheese, and you might say, “I can’t believe you sit there and you cook those chickens every day.” We don’t cook the chickens, the chickens come from the grocery store. Those are rottisserie chickens, from Market Street or whatever. 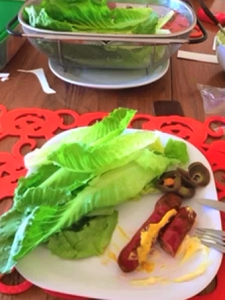 So how long does it take to cook this meal? 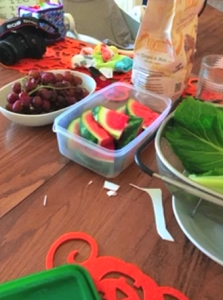 It doesn’t take very long at all because this came from the grocery store, you cut this. 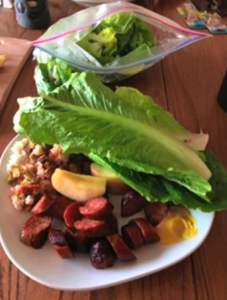 You notice I usually have the big, long pieces of lettuce? I just eat it with my hands and cutting it up and eating it with a fork. It takes a long time. It’s work — you put that thing in your mouth and eat it! Back in the the back there, that’s a little fruit salad with the pecans on it. So I showed you a few times I was eating potatoes. 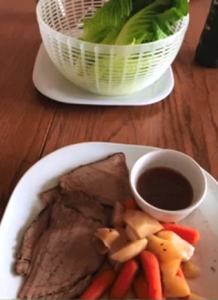 This is roast, it does have some carrots in it, but you have to count the carbs on your carrots and then these are turnips. Anything that you would cook a potato in, you could use a turnip for. A lot of times on the way to work, I have a smoothie for breakfast, this is protein smoothie. I guess that as the afternoon’s gone on the light’s kind of come on to the screen and it’s gotten dimmer so sorry about that. 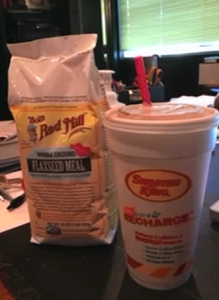 But here’s ground flaxseed meal. The ground flaxseed meal I use to thicken the smoothie and add some fat and add some omega-3 to the smoothie — to add some bulk. Because a protein smoothie, if it’s not made with something like heavy cream, it’s kind of not very filling. And so the ground flaxseed really adds bulk. This is what I don’t eat. These are those donuts from before. 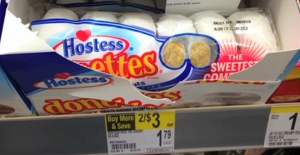 And so the problem with these donuts is they sell you $0.18 or less worth of ingredients for $1.79. And so these are the egg cups that you saw my wife making. We warm those up over and over and over so she doesn’t have to cook breakfast every day. 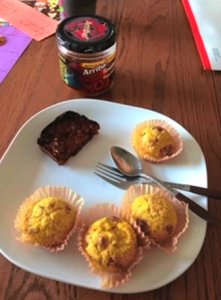 And then on the egg cups there’s also a piece of toast, also came out of the freezer — it’s made with almond flour. 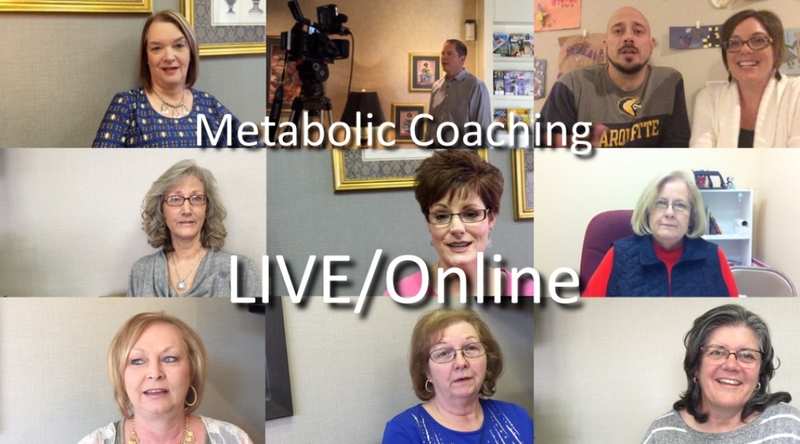 So some people have the perception: number one, what do you eat? Well, I eat eggs and toast just like a regular human being. The only difference is the toast, we have to make. We make it out of almond flour and freeze it, keep it on hand. And then we eat eggs just like anybody else. But do you have time to cook eggs every morning? No. But we just freeze them. 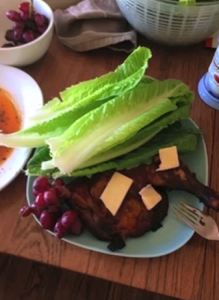 Lettuce, chicken, cheese, some grapes there. I snack on this all the time. 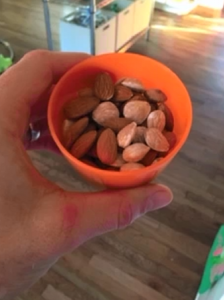 I didn’t have a picture of every single snack I had during the past several weeks, but almonds, I usually make salty and plain almonds and I just eat almonds all the time. This is sausage, apple, some okra with some rice. My wife put this on my plate — okra with rice — and I’m a polite guy. I said, “Oh, thank you.” I ate some okra out of it, I tasted some of the rice but I didn’t eat it. 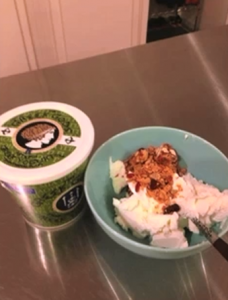 More Greek yogurt. My son made this for me, Greek yogurt with a little granola on the top and I guess using granola as a topping rather than a food group is okay. 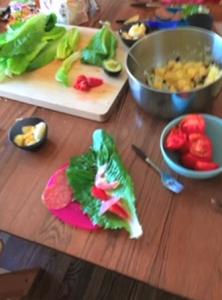 This is one thing we do a lot at the house is we just get out the cutting board, and on the cutting board, you put the lettuce, you put some salami, you put some cheese, you put some avocado and people just eat off of it. And a big giant bowl of tomatoes – because those came out of the garden. 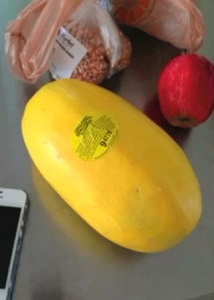 This is what a spaghetti squash looks like before you cook it. 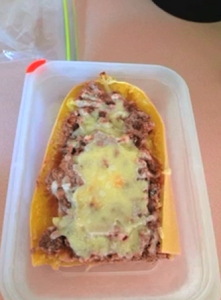 This is what it looks like after you’ve cooked it and you froze it. This one came out of the freezer. 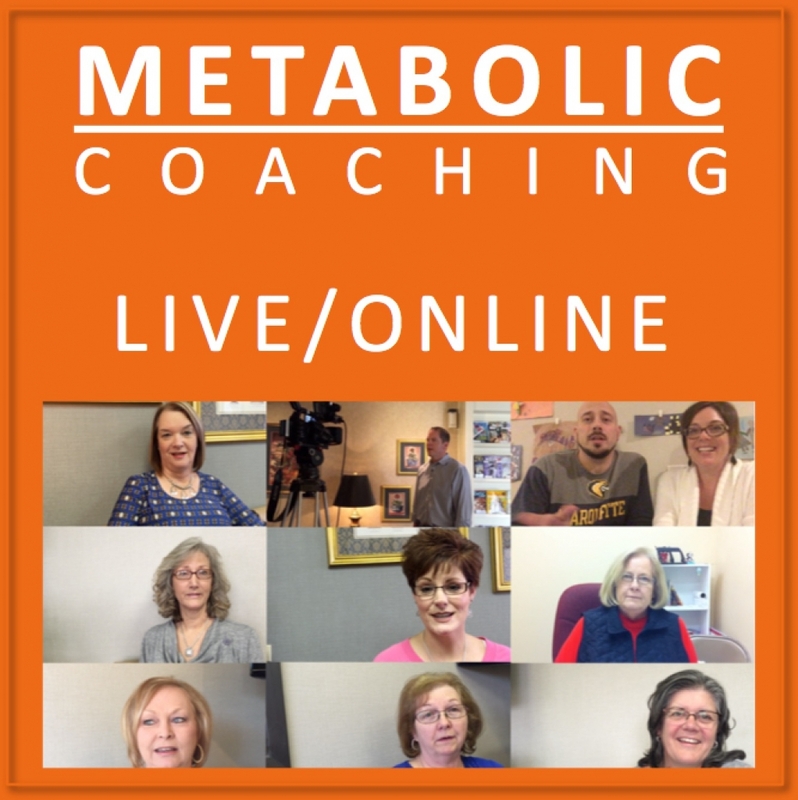 And pecans are wonderful and they’re good for you, and they’re a great snack – they’re a great low-carb snack – and you can eat a ton of pecans but they’re expensive if you buy them. 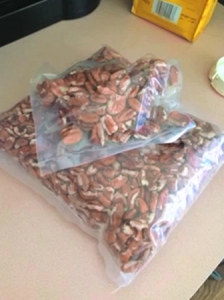 The good thing is, living here in Lubbock, there’s a lot of people that have a lot of pecan trees and you pick them up or your kids pick them up or your grandkids pick up the pecans and you go get them shelled locally and they’re not very expensive. You get them shelled locally, I think you get, like, $10 of pecans for $2.50. 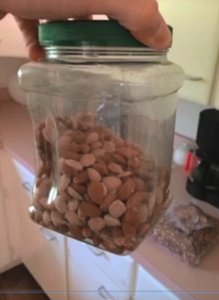 I keep this big giant thing of almonds in the refrigerator at all times, and I just eat that as a snack whenever I’m hungry. And usually, every day at 4pm, I’m hungry and what do I eat? I eat nuts at 4pm. 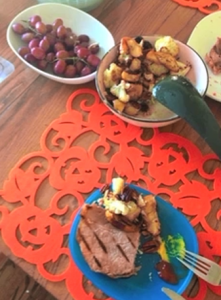 We eat dinner pretty early, and if I eat a bunch of nuts before dinner do I feel like it spoiled my dinner somehow? No. Because the nuts are so healthy for you. 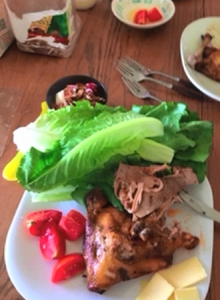 Chicken, lettuce, this is a wonderful sauce I don’t know what it is. This is the kind of protein smoothie I like, you have to order this online, it’s very expensive, but it tastes good, it’s called One World Whey, it tastes like ice cream. And the reason I order this is because I like the ingredients. 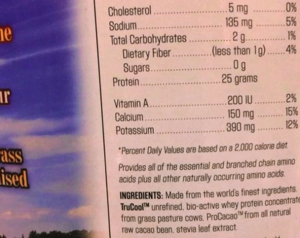 It says, Ingredients: number one, whey protein concentrate from grass-fed cows; number two, coco; number three, stevia. Most of the smoothies, they have so many ingredients and I just don’t know what all that stuff is. But I know what this stuff is: coco, stevia, whey protein.